We prefer if possible to deliver ourselves rather than send by pallet delivery. If you are less than 3 hours from DY11 we probably can, so please give Sadie a call to discuss. If you need a pallet delivery you can choose a day for delivery from Monday to Friday, it is delivered between 8am and 6pm. Hickmans usually send it to another company local to you, who do the last leg of the journey and the final delivery. 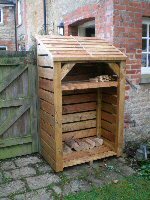 If you have not had your log store by 3.00pm on delivery day, please ring me and I will contact them and find out where it is. Your Log Store will be wrapped in plastic (like giant cling film!). It is treated and fully constructed, and once unwrapped is ready to place in its new home and use straight away. There will be cross head screws to remove from the batons we use to attach it to the pallet. Remove the cling film by cutting straight up one side so that it comes off in one piece. Someone needs to be there to sign that the delivery was received in good order. If you can't be in, contact me, I'm sure we can help. Please respect that the Pallet company driver is only contracted to deliver to kerbside, as near to the property as s/he can get. They are not able to move the log store for you, or to help you move it to where it is going to be sited. After delivery you will need two people to get it off the pallet and then move it to where it will be sited. They should never be moved or carried by one person, you run a real risk of ending up with 100KG of log store falling on you or putting your back out (or in my case shoulder). They should never be dragged either, this could damage the joints and/or wreck your floor. You can have a timed morning delivery for an extra £18. Choose any time between 10am and 2pm. A Saturday morning delivery costs £35, and should be delivered by mid-day. Contact me if you have not heard from them by 11am, and I will contact them to find out where it is. Usually one person will deliver, but if there is someone your end who can lift and carry a heavy weight we can help you to put it into place. If needed we may be able to send two people to help you put the log store in place, just let me know in advance. It can be a timed delivery within 2 hours, so no waiting in all day for couriers, and on a day of your choice including Saturday or Sunday. Please let me know about any delivery issues. Whether there is someone your end able to help or you have said you need two people, I still need to know before we deliver if there are any delivery issues; these include steps, slopes, gates, awkward bends, if it's going through the house, etc. It is also helpful to know if the distance from the van to where the log store will be sited is solid ground (we can trolley it) or pebbles (has to be carried). Tell me about difficulties beforehand and I will send you a nice fit young man as the second person. Evening delivery is available by arrangement, is usually for fairly local orders only because we like to get back at a reasonable time, but we really will try to help if this is your only option. Live further away and need help? Please make sure the surface for the log store is sound and level prior to delivery. Log stores should never be sited directly on soil/grass (they will rot), or on uneven surfaces (they could fall over). pebbles are great, slabs are good, even sleepers. Just not soil or grass. Scotland, Highland and Islands, remote areas, or more than 3 hours away. There is an extra pallet delivery cost which depends on your post code. If in doubt please contact me prior to order so I can get a quote from the Pallet Company. 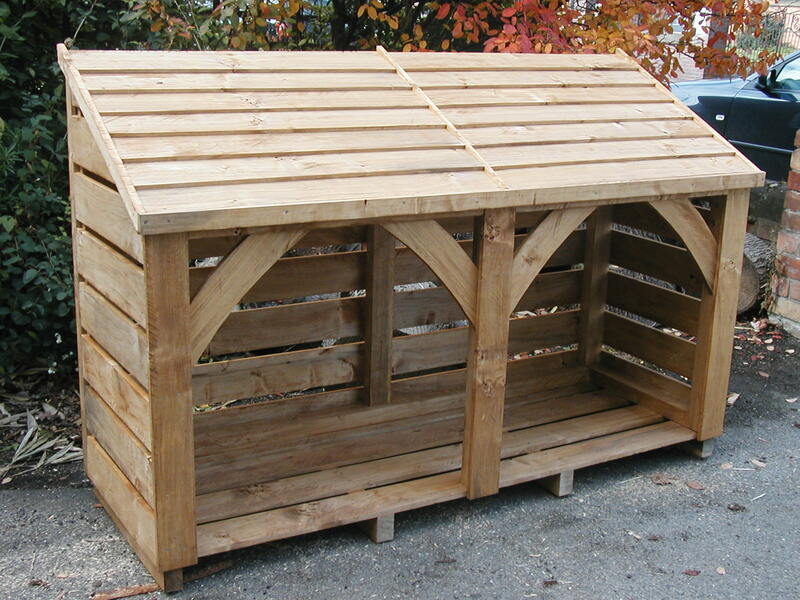 A recent pallet quote for AB postcode was £207. It may be possible for us to deliver if you are between 3 and 4 hours from DY11, give Sadie a call to discuss on 01562 864114. Islands delivery is from £155 extra for a pallet delivery. As an example a recent export to Ireland cost £250 for a double pallet size. Telephone 01562 864114, or email me by clicking here sadie@woodstores.co.uk and I will get a quote from the courier for you. Each item is individually hand made to order, so please allow anything from 3 weeks, and up to 10 weeks at busy times, for delivery. There is usually a lead time on the home page to give an indication about delivery times at the time you order. We will arrange with you if you have any requests for particular dates for delivery, construction, finish etc. Payment can be made either online by card (debit or credit cards) or by Bank Transfer, or by Cheque or cash on delivery. Credit or debit card payments can be made on our website, we use Paypal as a payment processor, however you do not need to have (or to open) a Paypal account to pay this way. Most email and telephone orders will be payment on completion. When we deliver you can pay by cash or cheque to us on delivery, or by bank transfer when we have delivered. We offer you a contact service, so if you are in any doubt we welcome questions to ask for more information before placing your order. We are more than happy to supply you with further details. Being a small family firm there may not always be someone available to respond immediately but we will reply as soon as possible. You may cancel (non bespoke) at any time prior to delivery at no cost. You may return (non bespoke) goods as change of mind after delivery. We can help you (if needed) with arrangements for the return but for a change of mind return you are responsible for all return costs. Just notify us within 14 days from receipt of the log store. You can let us know you want to return the goods by sending an email or by letter to the address in our contact details on the home page. The log store should be returned to us within a reasonable time from you informing us of cancellation but we do understand that these arrangements take time. All goods being returned on a pallet will need to be packaged to the pallet company standards (the pallet company will advise you on their requirements when you contact them). Some will pallet it for you for an extra cost. All goods being returned using our own collection service (by prior arrangement) will cost between £75 and £105 depending on distance. We will of course refund all of your original payment in a timely manner. Returns/cancellation for bespoke orders the cancellation costs will depend at what point they are cancelled. This does not in any way affect your Statuary Rights, a return because of for example damage on arrival by courier will never cause you any extra costs, and we will make all arrangements to collect, repair, replace or refund in those circumstances. We have aimed to show images of products to give you the best possible reflection of the item you are purchasing, however we do understand this is never quite the same as seeing something in real life. If you wish to view the log stores or would like larger images sent please give Sadie a phone call or email.